The BidRace website provides no information about who owns or runs the business. As I write this the BidRace website is nothing more than an affiliate login form. The BidRace website domain (“bidrace.com”) was first registered in 1999. The domain registration details were last updated in October 2018, suggesting this is when the current owner(s) took possession of it. I was able to confirm this with a Wayback Machine archive from August 2018, showing the domain was recently was purchased. The last Wayback Machine snapshot was November 17th, 2018, and still shows the “domain has been purchased message”. This means that the current BidRace website didn’t go live until late November, early December 2018 at the earliest. 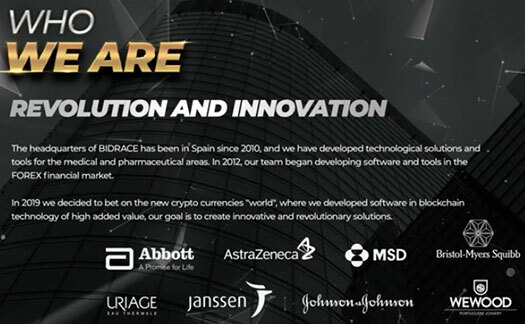 The headquarters of BidRace has been in Spain since 2010, and we have developed technological solutions and tools for the medical and pharmaceutical areas. In 2012, our team began developing software and tools in the FOREX financial market. Along with the inclusion of several trademarked brands, none of which have anything to do with BidRace, the company’s marketing claims are assumed to be baloney. As I write this BidRace appears to be being heavily promoted in Togo, a country in west Africa. Alexa currently cite Togo as the only notable source of traffic to the BidRace website (12%). The use of euros in the BidRace compensation plan meanwhile suggests BidRace is being operated out of Europe. Update 14th February 2019 – It appears Joao Severino might be running BidRace. As per Spanish corporation records for “BIDRACE TECH SOCIEDAD ANONIMA”, Joao Severino recently attempted to hide ownership of the company. Severino, as Fernandes Severino Joao Filipe, appears to have switched out sole ownership of BidRace Tech Sociedad Anonima with someone going by “Palmera Guedes Da Silva Pedro Manuel Do Nasciment”. The name-change was recorded by the Official State Gazette Agency on December 26th, 2018. Joao Severino is best known as one of the co-founders of USI-Tech. After setting the company up Severino retreated to the shadows. USI-Tech collapsed early last year following securities fraud cease and desist notices issued by multiple regulators. BidRace has no retailable products or services, with affiliates only able to market BidRace affiliate membership itself. BidRace’s compensation plan can be broken down into two primary components, affiliate fees and investment into “BID” points. The BID point side of the business is murkier. 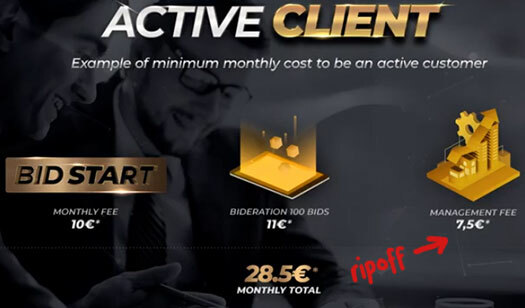 An example of an “active client” in BidRace’s marketing material cites a minimum monthly spend of 11 EUR on 100 BID points (0.11 EUR each). This suggests that Bid Start affiliates have to purchase at least 11 EUR worth of BID points each month. It follows that Bid Go and Bid Pro affiliates would have higher minimum BID point purchases, but this isn’t clarified. At first glance these appear to be ROI amounts but I’ve noted the 30 EUR for the Bid Start is pretty close to the total minimum active client cost of 28.5 EUR. So it could just be a rounded up total minimum monthly cost. 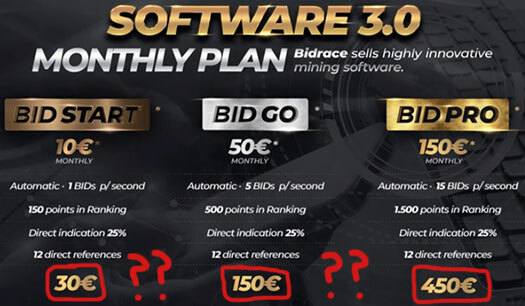 An example of “monthly gains” cites average 35 EUR monthly spend, so it’s definitely possible for BidRace affiliates to spend more than the 28.5 EUR minimum. Again, this isn’t properly explained in the compensation material so I don’t have a lot to work with. What we do know is that BidRace uses a unilevel compensation structure to pay commissions on affiliate fees (presumably including BID point investment). BidRace caps payable unilevel team levels at twelve. Note that each unilevel team level is “unlocked” through recruitment. An active affiliate is a BidRace affiliate who is up to date with affiliate fee payments. Recruit and maintain one active affiliate to unlock residual commissions on level 1. Recruit and maintain two active affiliates to unlock residual commissions on level 2 and so on and so forth. BidRace takes 1 EUR of every affiliate fee payment and put it into a Ranking Pool. The Ranking Pool is then “distributed by the 10 best leaders of the world”. Qualification for the Ranking Pool appears to be tied to downline investment volume. BidRace’s compensation plan material doesn’t state how often the Ranking Pool is paid out (assumed weekly or monthly). BidRace takes 1.5 EUR of every affiliate fee payment and puts it into a Top Racer pool. Each month this pool is paid out to the affiliate with the “most accumulated points in the current month”. 1 EUR is also set aside for an annual Top Racer Bonus. The annual Top Racer Bonus is paid out annually to the BidRace affiliate with “the most accumulated points in the current year”. According to the BidRace compensation plan, each BID point invested in equals 10 points. Whereas the Top Racer Bonus doesn’t track how points are obtained, the Top Consumer Bonus is specifically targeted to point investment. 1 EUR from each BID point investment is placed into a monthly Top Consumer Pool. The Top Consumer Pool is paid out to the BidRace affiliate who invests in the most BID points each month. 0.5 EUR is also set aside and paid to the BidRace affiliate who invests in the most BID points annually. 1 EUR of each BID point investment is set aside and placed into a raffle. The raffle is drawn monthly and paid to an active BidRace affiliate. The BidFounder Bonus rewards top affiliates in each country with 1% of that country’s affiliate fee and investment volume. The affiliate who introduced BidRace to a new country receives 0.5% of that country’s affiliate fee and investment volume. The more an affiliate invests the higher their income potential via the BidRace compensation plan. BidRace seems set up as a quick cash grab. As far as I can tell, on the front end you have your usual pyramid scheme recruitment commissions. layer three is the BDR altcoin, which isn’t mentioned anywhere in BidRace’s compensation documentation. BID points, the points used to calculate bonuses and BDR are worthless outside of BidRace. The first two are in-house currencies, which BidRace accepts in exchange for bitcoin. BDR is probably going to be used to exit-scam BidRace investors through when the time comes. So basically you have affiliate’s handing over BidRace’s anonymous admins bitcoin, in exchange for worthless BID points. I imagine there’s probably an internal exchange to convert BID points to BDR, with the same exchange used to cash out BDR. That’ll continue for as long as BidRace’s admins want to seed the scam with invested bitcoin. This recycling of newly invested funds to pay existing affiliates makes BidRace a Ponzi scheme. After BidRace’s admins decide they’re done seeding returns, BDR will get listed on some dodgy exchange and they’ll exit stage-right. BidRace’s affiliate bagholders will be left to trade among themselves, as BDR’s public “value” approaches $0 (BidRace’s admins will naturally cash out the second BDR has a public exchange value). Top BidRace affiliates who more than recovered their investment losses through recruiting will stall, hold webinars, blame victims, yada yada yada. You should by now be familiar with how an MLM cryptocurrency scam collapse plays out. There’s probably some finer points I’m missing due to BidRace’s hopeless compensation material, but that’s pretty much the gist of it. And it’s enough to certify that BidRace’s passive investment opportunity is a security. In order to operate legally, BidRace would need to register themselves with the appropriate securities regulator in every jurisdiction they operate in. To that end BidRace provides no evidence of their website of having registered their securities offering anywhere. Instead, the company laughably expects people to believe they’re safeguarding investment in banks. The BDR warranty will be deposited in first-rate Banks. BIDRACE will be audited and regulated, showing to our affiliates that we are a reliable business. Regulation of securities offerings begins with registration with securities regulators. Yet here we have BidRace actively soliciting investment, before they’ve registered to operate legally. Review updated acknowledging likelihood BidRace is another Joao Severino scam.